Seviteronel (INO-464) is an oral, selective cytochrome P450c17a (CYP17) 17,20-lyase (lyase) and androgen receptor inhibitor with in vitro and in vivo anti-tumor activity. 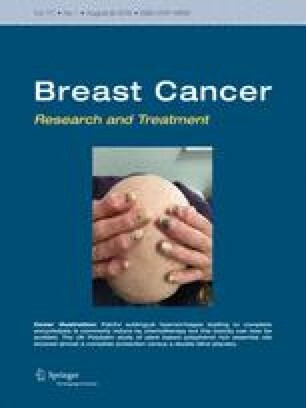 This open-label phase 1 clinical study evaluated safety, tolerability, pharmacokinetics (PK), and activity of once-daily (QD) seviteronel in women with locally advanced or metastatic TNBC or ER+ breast cancer. Seviteronel was administered in de-escalating 750, 600, and 450 mg QD 6-subject cohorts. The 750 mg QD start dose was a phase 2 dose determined for men with castration-resistant prostate cancer in (Shore et al. J Clin Oncol 34, 2016). Enrollment at lower doses was initiated in the presence of dose-limiting toxicities (DLTs). The primary objective of this study was to determine seviteronel safety, tolerability, and MTD. The secondary objectives included description of its PK in women and its initial activity, including clinical benefit rate at 4 (CBR16) and 6 months (CBR24). Nineteen women were enrolled. A majority of adverse events (AEs) were Grade (Gr) 1/2, independent of relationship; the most common were tremor (42%), nausea (42%), vomiting (37%), and fatigue (37%). Four Gr 3/4 AEs (anemia, delirium, mental status change, and confusional state) deemed possibly related to seviteronel occurred in four subjects. DLTs were observed at 750 mg (Gr 3 confusional state with paranoia) and 600 mg (Gr 3 mental status change and Gr 3 delirium) QD, with none at 450 mg QD. The recommended phase 2 dose (RP2D) was 450 mg QD, and at the RP2D, 4 of 7 subjects reached at least CBR16 (2 TNBC subjects and 2 ER+ subjects achieved CBR16 and CBR24, respectively); no objective tumor responses were reported. Once-daily seviteronel was generally well tolerated in women with and 450 mg QD was chosen as the RP2D. Aditya Bardia and Ayca Gucalp contributed equally to this work. The online version of this article ( https://doi.org/10.1007/s10549-018-4813-z) contains supplementary material, which is available to authorized users. This study was funded by Innocrin Pharmaceuticals. E.S.B-B and J.R.E are compensated employees of Innocrin Pharmaceuticals. T.A.T. receives compensation as a Steering Committee member for Innocrin Pharmaceuticals.